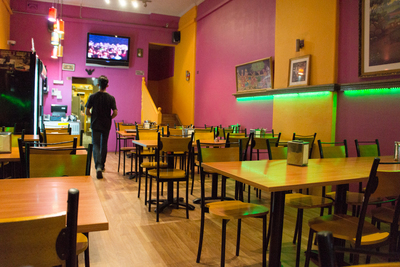 Kammadhenu is a Sri Lankan / Indian/ Malaysian restaurant in Newtown. A Sri Lankan friend recommended this place to us and we went there last night. Even though the place doesn't look like very much, the minute you walk in you are engulfed in a beautiful aroma of spices. We ordered hoppers which are a Sri Lankan speciality. 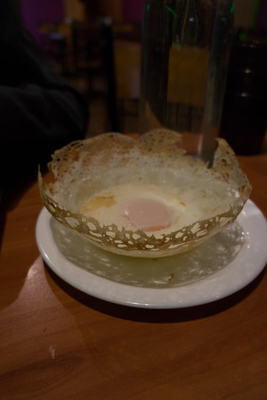 I went for the String Hopper ($7), my husband tried out the Egg Hoppers ($3.50 each) and our Sri Lankan friend ordered the Plain Hoppers ($5 for two pieces). The food took a while to arrive, but it was well worth the wait. Being an Indian, I will say that Sri Lankan cuisine has a completely different taste. We absolutely loved the food. It was slightly spicy for my Polish husband but the the Seeni Sambal (sweet caramelised onion dish), however was a perfect sweet accompaniment. The service was great, the restaurant was very neat and clean, the food was absolutely delicious and we ended up spending less than $50 amongst 3 people, with drinks. If you are in the mood to try out something different, Kammadhenu is a must stop for you. They have another branch in Neutral Bay. Quite like their Malaysian cuisine and dosas too. I beg to differ. The food is mediocre and tasteless.